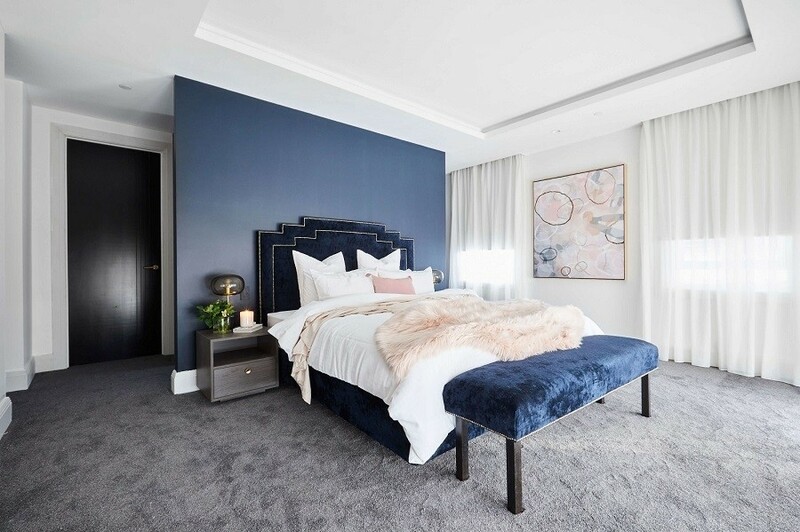 This week was all about the master bedroom, and the teams really put out all the stops to win, or did they bite off more than they could chew? Let’s start off with the team that seemed to have everything planned to a T. Kerrie and Spence ended up ahead of schedule this week as they thoroughly planned out their room and didn’t get too ambitious. 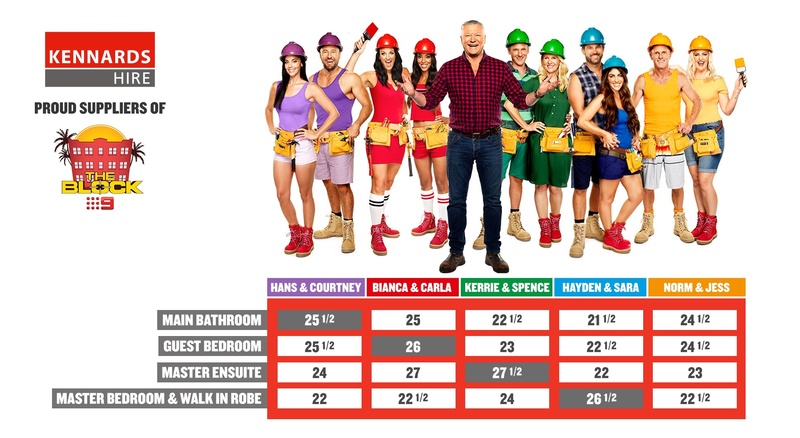 As you might recall, Kerrie and Spence stole the master bathroom win from Bianca and Carla last week with their 1 point gnome (catch up on Week 3 with our blog). They’re bright white bathroom was elegant and simple, and they may have been trying to make the same statement in their master bedroom. Unfortunately whatever they were trying to achieve fell flat with the judges. While Shaynna, Darren and Neale loved the crushed velvet, again Kerrie and Spence hadn’t given the room a personality and in the end the judges felt that they hadn’t quite got there yet. So take note, go find all of your crushed velvet clothes from the naughty nineties and make a giant throw out of them. Then you’ll have a room screaming luxury. Upstairs in Courtney and Hans master bedroom, the judges were partly impressed with the sheer size of the bedroom, but it ended there. They hated the artwork. Then they remarked that the craftsmanship was sub-par. Perhaps Hans and Courtney bit off more than they could chew? Near the tail end of the challenge Hans got a bit nervous about how much they had to paint. Mate when you create a 65 square metre space, you don’t use a roller. You bring out the big guns. Why spend hours going up and down with a roller when you can smash out the entire job in half the time with an airless sprayer? Do you need a lesson on how to use one Hans? We’ve got a killer how-to video on airless sprayers here. For some reason Bianca and Carla were still too chilled with their builders this week, and it certainly got on Foremans Keith and Dan’s nerves. Not supervising the build meant they missed installing the air con duct in the master bedroom, their feature wall was crooked, and the panels weren’t flush against each other. Keith and Dan reminded the supreme netball team that those details would not go un-noticed. Out of anyone on The Block, one would think if Keith and Dan make a point of showing poor work a team should seriously consider fixing the mistake, right? What’s worse, when the girls returned from paddle boarding instead of perfecting the room (You read that right. PADDLE BOARDING. ), they discovered the duct problem and didn’t have any time to fix it. Ain’t nobody got time for paddle boarding on The Block! After one victory and a near victory, maybe the girls thought they could let this slide. What they failed to remember is that on a live site, the foreman is king. What Keith and Dan says, goes. They’re not there to give anyone a hard time or to waste your time. Their sole purpose is to make sure everyone is working safely, and the rooms the teams create, no matter how luxe they are, are up to code and safe to live in. Norm and Jess, while they haven’t won a challenge yet, are plowing through and getting it done. No whingers here! They did become 48 hour Challenge Champions once again this week with their groovy surf caravan, and went straight back into it afterward to try and finally take a room reveal win. Unfortunately that just doesn’t happen. Neale Whitaker likens their mast bedroom to Gold Class seats, with too much going on in the space. Apparently a master bedroom is no place for a TV. Jess must have forgotten that even she said “rich people don’t watch TV. They read books!” They should have stolen Bianca and Carla’s sweet TV setup, where when it’s not in use it’s turns into a work of art. So apparently rich people do watch TV, as long as it’s done discreetly, which makes it a tad difficult when you’re on a Netflix binge! So at this point in the recap you probably already know who the winner is. And what a dramatic journey it was to this victory. First Sarah is a sore loser, and we mean so whiny we had to turn the volume on our TVs down as her spats are causing serious ear drum damage. Then she threatens to walk off because she should have won the master bathroom room reveal. Wouldn’t it be an interesting twist if Hayden and Sara simply got kicked off The Block for their diva antics? Just think about that for a second. That would flip The Block on its head, but damn that would make good television. So this week Sara takes up Shaynna on her offer of an hour session to advise on what works and what doesn’t in terms of styling. What happens? Sara whinges. Sara doesn’t listen. Hayden stands mutely in the background. Sara insults Hayden. Sara and Hayden argue. The list goes on and on. We really couldn’t tell what was actually being built and done in the room with all the negativity. But Sara must have listened to Shaynna, because as the judge (who has 30 years of experience in styling to Sara’s 0) put it on judgement day, the couple “shows restraint” in their master bedroom. Going over the top and putting ludicrously expensive items in the room doesn’t make it luxurious. Putting rich tones, classy accessories and wall colours to match can make a room exude luxury. Granted there were a few missed paint spots, but in this race against time and opulence, which room was absolutely perfect? Let’s hope Sara takes the advice on board with future rooms. Here are the scores so far!